OGM’s Matsuura Lumex Avance-25 was installed late last year and, after extensive trials, is now entering full production capacity. The machine incorporates powder bed-type/laser-melt additive manufacturing in a machine that additionally features a milling spindle (45,000 rpm, BT20 as standard), with additive part build-up interspersed with machining. It has a 260 by 260 by 100 mm working envelope. Mould tool cavity insert manufacture is the main target application for this machine, so it is no surprise that this installation follows that trend. The ability to produce conformal cooling channels that reduce moulding cycle times and boost part quality are the big pluses heralded for these machines. There is an additional, similar Matsuura Lumex machine (https://is.gd/voxovu) installed at the Manufacturing Technology Centre (MTC) in Coventry. In fact, that installation was the prompt for OGM’s purchase, according to the company’s Marcel Gowers, additive manufacturing applications engineering manager. The mould tool insert, designed by OGM and produced as a demo by Matsuura, was the first such conformally-cooled tool used by the company, Gowers reveals, adding that it was used in an existing mould tool bolster and delivered a reduced cycle time, while part quality “increased dramatically” for a key element of the part. The scale of benefit was very attractive, as OGM has almost 50 injection moulding machines to tool. The company, which employs circa 200 people, has multiple sites in the UK, but its 100-employee headquarters in Kidlington, Oxfordshire, is host to the majority of its injection moulding capacity, 34, with a site in Wales, acquired last year, having 13. That capacity will be added to, however, with a further seven machines anticipated. The company moulds parts for very many well know industrial names and boasts sales of in excess of £11m (parent OGM Holdings’ figure is £20m+), previously sourcing mould tools in support from external suppliers. 3D-printed ‘ConformL Cool’ mould tool inserts, as the company is calling them, plus the manufacture of 3D-printed end use components and the fast production of mould tool inserts were the three elements of its original plan. But of the mould tool insert idea he reports that it became clear that customers didn’t want inserts but “loved the concept of rapid tooling” [complete tools]. Fast time to market was found to be key. With mould tools from the UK on 12-14 weeks’ lead time, China offering at least six-eight weeks, the requirement was for a four-week lead time, which OGM can satisfy with a hard, or even fully hardened, production mould tool. 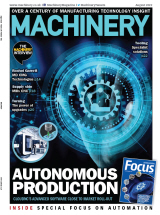 “Save your four weeks and £5,000-8,000 [for soft tooling], come to us and we can make a proper rapid production mould tool that you can use for prototyping that we can then have hardened, if you so wish, to take you to many hundreds of thousands or millions of parts,” says Gowers. The company’s new in-house toolmaking activity is supported by what the company is calling its rapid production mould tool (RPMT) service – a first for the UK. This is currently based around various sizes of custom off-the-shelf bolsters, part-machined, with insert manufacture and final machining undertaken thereafter. It has already bagged £1 million sales for mould tools for use in house, using its RPMT process that utilises the Lumex machine. By way of demonstration, the additive manufacturing applications engineering manager says that the company has already completed a quarter of a million parts from such a hardened tool. The inserts were ‘grown’ in eight hours, overnight, the standard bolster took three days, with integration of the pair adding a further two days. Not all inserts necessarily feature conformal cooling, incidentally, and not all will be made totally via the hybrid route – they could still be subcontracted, either overseas or locally, although the fastest response will always likely be the hybrid route. For simple inserts, even a one-week lead time is possible. And inserts will often see CNC machining undertaken off the hybrid machine, with the complicated elements – “which we try to keep to a minimum” –then produced on the Lumex Avance-25. For rapid tools for parts that have at-risk susceptible features (clips, latches and so on), the use of hybrid AM-produced cavity tooling inserts allows these features to be fine-tuned as production progresses, with inserts swapped out quickly. A further example of the technology’s use is with a tool repair involving a 600-micron thick blade insert for an onsite tool. The blade was grown overnight, wired off the base, ground and fitted, with tool repair effected by 2 pm the next day – an external quote to replace that insert had put a two-week lead time on its supply. OGM is also experimenting with production of surface textures. 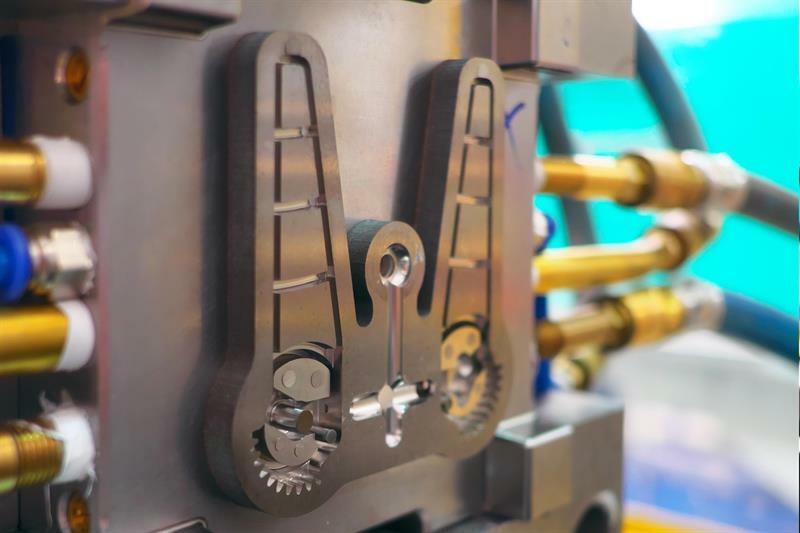 RPMT also supports supply only of the completed tool, so firms can perform their own moulding, but this has not yet happened, while the manufacture of mould tool inserts, which may/may not require conformal cooling, has a had a few takers. There’s a plan to develop new software that will allow the company to quote for tooling on a 48-hour turnaround, with 24 hours targeted, while a planned service for end-use part is in its infancy. Poole-based Cable First is the first company in Europe to install a Sodick OPM250L hybrid powder bed-type, laser-melt machine (supplied by Sodi-Tech EDM, https://is.gd/lotawi). This unit can produce parts up to 250 by 250 by 250 mm and incorporates a 45,000 rpm spindle served by a 16-tool magazine. Cable First’s main business is the production of bespoke cable assemblies and harnesses for a wide range of sectors, working closely with its sister company, bespoke cable maker Concept Cables Ltd. Both companies, employing 45 personnel each, are part of the Gemaco Group, which has a turnover of some £8m. As Cable First’s managing director, Allen Lodge, explains, although the Sodick machine is capable of producing complex mould tool dies and cores having conformal cooling in single-piece components that would otherwise require multiple parts to be made and assembled, the machine is primarily the answer to an industry-wide issue: lack of skills, specifically mould toolmakers for Cable First’s expanding business. It makes mould tools for internal use in the manufacture of its cable harnesses, currently around 50/year. The OPM250L will do what it does reliably, in the time the program says, too. Not so traditional toolmaking that is variable. And the more complex the part, the more advantages the Sodick machine has, he observes. But Cable First’s million-pound investment is not about toolmaking, rather it is based on the business those special tools support for seamless product manufacturing, from design stage to the finished product.